Lock your car doors – the National Insurance Crime Bureau (NICB) just released their latest car theft hot spots report. 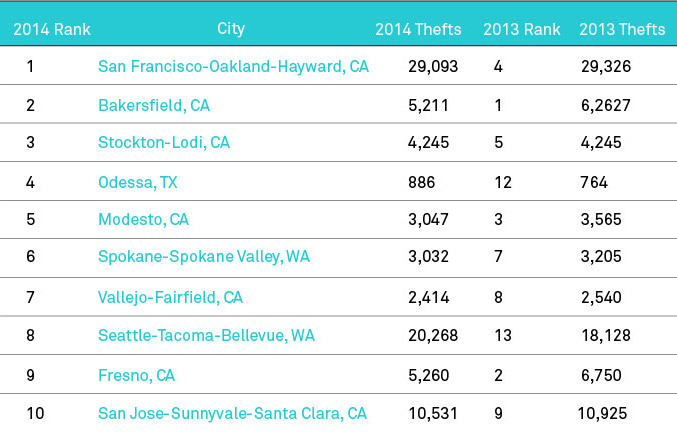 California topped the list with the highest automobile theft rates in 2014, with eight cities included in the top ten. Washington was up next with two cities. But don’t be alarmed – keep reading for tips on how to prevent car theft! While there isn’t a concrete reason why theft is so high in California, there are a few theories to consider. Factors include the large volume of cars compared to other states and the nice weather keeping cars in pristine condition, therefore making them more desirable to steal. It’s also important to note that since this was a population-based survey, an area with a much smaller population and moderate number of thefts can have a higher theft rate than an area with a more significant vehicle theft problem and a larger population. Don’t leave bait. A major motivation behind car theft is to acquire whatever is inside. That new stereo or big mystery bag sitting on your back seat is mighty intriguing to a thief! Keep everything stashed and out of sight to avoid someone breaking in to snoop around. Lock your doors. This may seem obvious, but up to a quarter of vehicle thefts are from unlocked cars. Even if you are quickly running inside a gas station, that’s still enough time for a thief to make moves. Make your car ironclad. Many cars are broken into with the intent of stealing the actual vehicle, so beef up your interior to prevent this from happening. Accessories like steering wheel locks, steering column collars, and brake pedal locks are both intimidating and discouraging to a thief. Park smarter. It might be difficult to find a coveted spot on a busy street, but it is definitely harder for a thief to operate in a highly trafficked area. Check out our parking guide for tips. In the unfortunate event that your car is stolen, there are tracking systems that you can subscribe to that will help find your car. Per-mile insurance customers have access to Metromile’s smart driving app, which has a car locator feature. We’ve happily been able to help several customers recover their stolen cars. If you are interested in learning about per-mile insurance, you can learn more here. Stay safe out there!